Transportation System Plan Update | Kittelson & Associates, Inc. Thank you to everyone that provided comments! The first phase of public outreach is now closed. We are working on reviewing your input to help us identify solutions and maximize opportunities for developing the future transportation plan. Whether you live, work, or travel in Hillsboro, we would like to hear from you about any issues or concerns you may have as you get around the city. Where in Hillsboro does transportation need the most love and why is it needed? Is it 185th Avenue where there is rush hour backup? Is it Brookwood Parkway where there are not enough buses? Is it Cornell Road where the bike lanes feel unsafe? Is it TV Highway where it is difficult to cross on foot? Is it somewhere else along your typical route? By sharing your thoughts on this map, you will help better position the City to identify solutions and maximize opportunities in developing our transportation system. What bothers you most in your daily commute? Where are the traffic hot spots in the City? What are the intersections where you’d like to see improvements? Where are the locations you feel unsafe or notice safety issues? 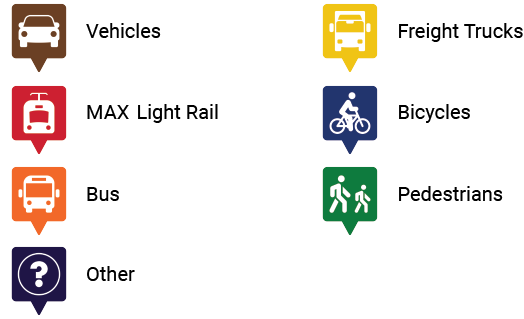 Choose from the following categories to indicate whether your comment addresses an area where you drive, take transit, ride your bicycle, or walk. Feel free to add multiple comments for the same location where the feedback is relevant for more than one mode of transportation. If your comment addresses an aspect of the roadway that is not particular to a specific mode of transportation (e.g., lighting, landscaping, or an intersection generally), choose the “other” category. For more information on how to leave a comment or second an existing comment, see the instructions in the top right-hand corner. Opinions expressed are those of the authors alone and do not necessarily reflect or represent the views, policies, or positions of the City of Hillsboro. The City of Hillsboro reserves the right to use its own discretion when determining whether or not to remove offensive comments. La Ciudad de Hillsboro está actualizando el Plan del Sistema de Transporte. Este documento constituye el plan de la Ciudad para las inversiones de transporte durante los próximos 20 años. Si usted vive, trabaja, o viaja en Hillsboro, nos gustaría oír sus comentarios sobre los problemas o desafíos que enfrenta mientras recorre la ciudad. ¿Cuáles lugares necesitan mejorar y por qué? ¿Es 185th Avenue, donde hay congestión durante las horas punta? ¿Es Brookwood Parkway, donde no hay autobuses suficientes? ¿Es Cornell Road, donde los carriles de bicicletas no parecen seguros? ¿Es TV Highway, donde es difícil cruzar a pie? ¿Es alguna otra parte en Hillsboro? Por favor, comparta sus pensamientos en este mapa, y ayudar a la Ciudad a identificar soluciones y maximizar las oportunidades para desarrollar nuestro sistema de transporte. Elija entre las siguientes categorías para indicar si su comentario se trata de un lugar en donde maneja su vehículo, viaja en transporte público, anda en bicicleta, o camina. Puede usted agregar varios comentarios para el mismo lugar, incluso si su observación se aplica a más de un modo de transporte. Si su comentario se trata de algún otro aspecto del sistema de transporte que no es específico de un modo de viaje, seleccione la categoría "other." Having trouble viewing or using the map? Please contact tsp@hillsboro-oregon.gov with your comments.